Locally owned cigar manufacturer reaches out to The Factory Advertising to build their website in time for their national launch at the IPCPR in Las Vegas. IPCPR 2014 (International Premium Cigar & Pipe Retailers) is the oldest, largest and most active trade association representing and assisting retail tobacconists. 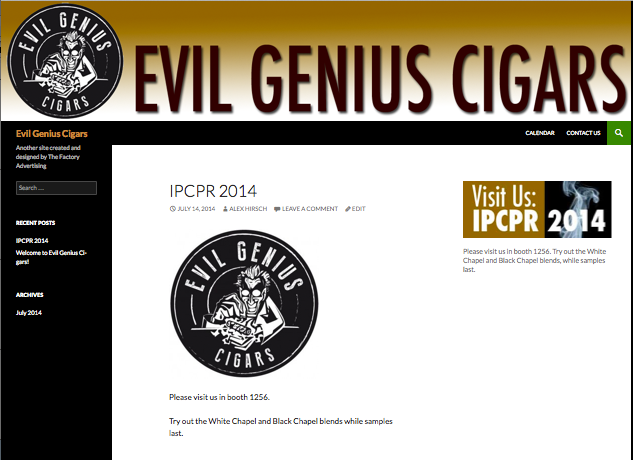 Evil Genius Cigars needed a website in order to support their trade show efforts at their national launch of their White Chapel and Black Chapel cigars. Alsocritical was to present the brand and to provide a mechanism to capture and build their email database. The Factory Advertising was selected to build the site and did so in a weekend. The site is currently live and is continuing to evolve in order to meet the needs of the consumer and their prospective retailers. Visit the site: EvilGeniusCigars.com often to see how the site will be evolving.